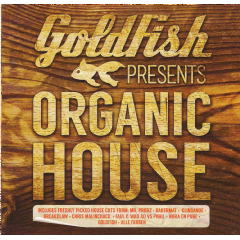 At the core of Goldfish has always been the collision of real, live “organic” instruments with electronic beats, creating an uplifting blend of dance music. Over the past few years a ground swell of like minded artists has begun to develop the same organic musical aesthetics. It seems like almost overnight this sound that we love so much has exploded online and onto the collective airwaves worldwide. Some people refer to it as “Deep House” – and although it does owe a fair amount of inspiration to this genre, it definitely has its own set of unique characteristics, so we found the need to differentiate it with its own genre: “Organic House” was born. This compilation features some of the biggest tracks currently rocking dance floors, as well as a selection of future classics. It’s more than just a compilation of the freshest sounds but a state of the nation: Organic house. Featuring previously unreleased NO.1 Goldfish track Moonwalk away (Moonlanding mix) as well as hit tracks by Bakermat, Faul and Wad ad, Klingande and more in 1 Summery playlist that will keep you going all day (and all winter)!